Vegetarian fritters have been made in Mediterranean countries for centuries. Made with simple ingredients such as leeks, breadcrumbs, eggs and parsley, these fritters will stand out when you serve them as a side for your Thanksgiving turkey! 1. Bring a 2 to 3-quart pot of water to a boil. Stir in 2 teaspoons salt. 2. Add the leeks to the salted, boiling water. 3. Cook leeks for 3 to 5 minutes or until just tender. 4. Drain leeks in a colander and transfer them to a bowl. 5. Using shears, cut the leeks to make 1/2 to 3/4-inch pieces; set aside. 6. In a large mixing bowl, combine the beaten egg with the salt, nutmeg, black pepper and parsley. 7. Stir in the leeks and 1 cup of the breadcrumbs. 8. The mixture should amalgamate. If it is too wet, gently stir in the remaining breadcrumbs. 1. Heat enough oil in a 12-inch skillet so that the oil is 1/4-inch high. 2. As the oil heats up, with your hands, form 2-inch patties, slightly flattened. 3. Gently put each patty into the hot oil, standing back to avoid splatters. 4. Fry the fritters on medium-high until the undersides look light golden brown – about 2 minutes. 5. Using a black spatula and fork to assist the turning, turn the fritters over. 6. Cook the second side of the fritters for 2 minutes or until they are light golden brown. 7. Transfer the fritters to a plate lined with paper towels. 8. When all fritters are done, transfer them to an oven-proof baking dish (do not line it with paper towels). Cover the dish with aluminum foil. 9. Right before serving time, warm up the leek fritters, covered with aluminum foil, in a preheated 350°F oven for 15 minutes. 10. Garnish with parsley or basil sprigs and serve. I still have lots of chard sprouting like weeds in my vegetable garden. Here’s a simple, but fine-tasting recipe with limited ingredients. This means that if you’ve got to buy chard to make this dish, your cost won’t break the bank. I know this is a good thing, since many of us are aiming for bargains at those end-of-summer sales. Enjoy Chard and Tomatoes as a healthy and delicious side to grilled meats, poultry or seafood dishes. 1. Rinse, drain and spin dry the chopped chard in cold water about 3 to 4 times (this will remove dirt particles). Set chard aside. 2. Meanwhile, bring a 5 to 6-quart sauce pot filled with water to a boil. 3. When water is boiling, add the chard. 4. Cook chard about 2 to 4 minutes or until it is wilted and tender, but not overcooked. 5. 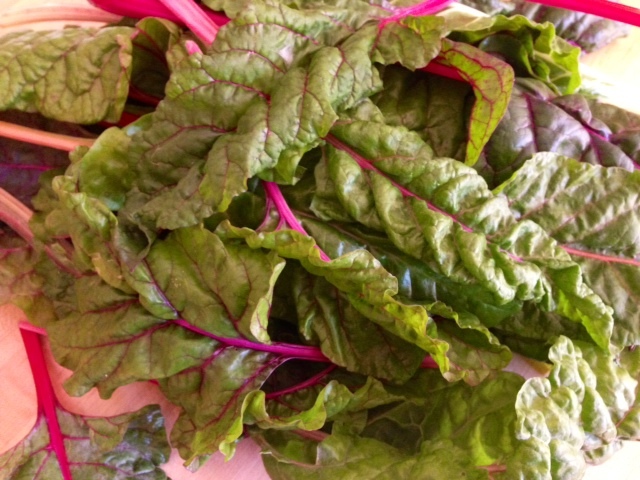 When chard is cooked, drain it in a colander and let it cool slightly, for about 5 minutes. 6. Drain the chard very well and transfer it to a serving bowl. 7. Stir the oil, salt and pepper into the chard. Add tomato pieces and stir once more. 8. Taste, adjust seasonings and serve immediately. These days we’re all workin’ hard and getting home tired and hungry. Takeout is always a lifesaver, but after a while, it all tastes the same. For a quick one-dish dinner, all you need is a pound of spaghetti, peppers, onion, and one or two other seasonal veggies. Oh – and don’t forget to pour in some of that white wine you opened last night! Treat yourself to this gourmet pasta in a quarter hour and … Buon Appetito! 1. In a food processor, grind (but do not liquify) together the squash, zucchini, onion and bell pepper chunks. Set aside. 2. Meanwhile, bring a 4 to 6-quart pot of water to a boil and set aside; keep it at a low boil. 3. In a 12-inch skillet, heat the oil. 4. When oil is hot, stir in the ground vegetables and sauté them, stirring occasionally, for 2 to 3 minutes. 5. After 2 to 3 minutes and when sauce begins to cook down, stir in the wine. 6. Saute the sauce on medium heat, stirring occasionally, for about 2 minutes. 7. After 2 minutes, add 1/2 cup of the water and cook for an additional 2 to 3 minutes. 8. Stir in the salt and pepper, to taste, and cook for an additional 1 to 2 minutes. If the sauce looks too dense or dry, stir in a little more water. 9. Turn off the stove burner, but keep the sauce warm. 10. Meanwhile, cook the pasta according to package directions. When pasta is cooked, drain it. 11. Stir the drained pasta immediately into the sauce in skillet and heat through. Serve Summer Spaghetti with grated Parmigiano Reggiano or Pecorino Romano cheese. Feel frustrated when you open the refrigerator and see one of every vegetable? Any thoughts of mounting one vegetable on a pedestal and letting it shine solo are immediately gone. Recently, I found myself holding one fennel, one potato and one zucchini in my hands. As I grabbed these three veggies, I was about to toss them in the trash. I ultimately decided not to do that because they were still fresh. So I became creative and found myself cutting up the trio into one-inch chunks. I then threw the melange into a medium pot covered with cold water and …. Well, just look at the photo! This fennel, potato & zucchini mash is exquisite, healthy and vegan. 1. Rinse the peeled and cut vegetables in cold water and drain. 2. Transfer to a medium pot and cover with cold water. 3. Bring to a boil and cool approximately 8 to 10 minutes or until all vegetables are fork-tender. 4. Drain the cooked vegetables completely. 5. Using a hand masher or a handheld electric mixer, beat the vegetables until a puree is formed. Stir in the olive oil, salt and pepper, to taste. Serve immediately as a side dish to chicken, seafood or meat. Alternatively, serve as part of a vegetarian or vegan meal. How do you prepare Brussel sprouts? Do you boil or steam them? I sauté Brussel Sprouts with a splash of Whisky or wine. As they cook, the alcohol reduction makes this simple veggie sweet – and happy! Enjoy these Drunken Brussel Sprouts as a side dish for your Thanksgiving turkey. You’ll get great reviews on this recipe. 1. Working over a sink, trim and discard the stubs from the Brussel sprouts. Remove outer leaves, cut the sprouts in half lengthwise. As you cut the sprouts, place them in a bowl with cold water. 2. Drain the Brussel sprouts and pat them dry with paper towels; set aside in a bowl. 3. Heat the oil in a 10 to 12-inch skillet. Add the Brussel sprouts and stir fry on medium high heat for about 2 minutes. 4. Stir in the chopped onion and stir fry 2 minutes or until onion is clear. 5. Add Whisky or wine, salt and pepper to the Brussel sprouts in skillet. 6. Reduce heat to medium-low and cook 3 to 4 minutes or until the sprouts are crunchy-tender. Cook 1 to 2 minutes longer for a softer consistency. Serve as a side dish to poultry, meat or fish.